Ryan Blake transitioned into his career as a real estate broker after over a decade of sales experience in the medical device industry. The skills he developed in that field, including organization, prompt response, transparency, honesty, and providing a quality customer experience—have translated easily into his work as a broker. As a real estate investor, Ryan has had a longtime passion for construction and development, allowing him to provide his clients with additional insight on the many nuances of a particular property they are looking to buy or sell. He is also president of his condo board and able to advise clients on what to expect if they’re buying into an association. 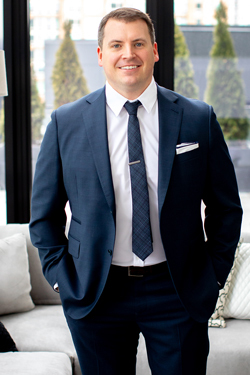 Ryan believes in a genuine approach to the real estate process, striving to develop better relationships with clients and achieve results that are focused less on the sale and more on satisfying all parties involved. Ryan specializes in Chicago’s metropolitan housing market, with expertise in both existing residential real estate and new constructions. An 11-year resident of Lincoln Park, he also has particular knowledge of the neighborhoods of Lakeview, Old Town, Gold Coast, River North, Bucktown, Wicker Park, West Town, Ukranian Village, West Loop, and South loop. In his free time, Ryan enjoys working out, playing golf, spending time with his dog, and watching sports.